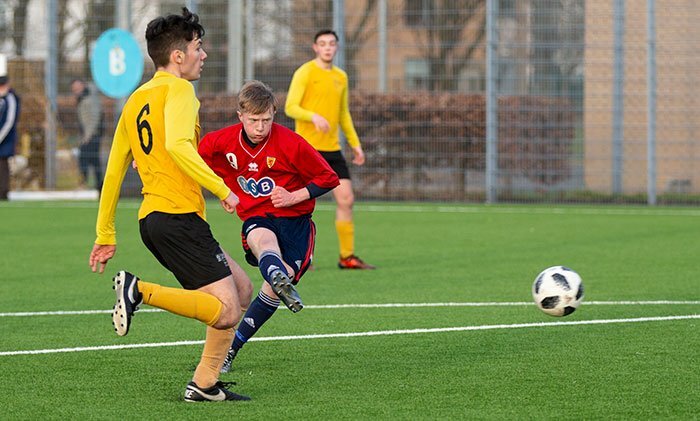 With less than a month to go before the SSFA international boys’ squad plays its first 2019 Centenary Shield game, away to Northern Ireland at Crusaders, Belfast on 7th March, the team’s preparation continued on Monday 11th February when they played Glasgow University U21’s at Toryglen. The Uni kindly helped out by providing opposition and they proved difficult opponents in a game which was closer than the eventual 5 – 0 scoreline in favour of the SSFA side suggests. The weather too was kind for the game played on the new outdoor astro at Toryglen. The schoolboy side showed a number of changes from the team that earned a recent well deserved 2 – 2 draw with the visiting Australia side who were touring the UK and the Republic of Ireland in late January. Three players who were unavailable for the friendly international had recovered from slight injuries but a different three players were not available for selection for the game against the student team. Unfortunately Archie Meekinson (St John’s HS, Dundee) sustained a broken collar bone while training with his club side Dundee United. Archie will hopefully recover before the Centenary Shield is completed in April but a replacement, Finlay Robertson, also from St Johns’ HS, Dundee, has now been called in. The new look team started brightly and created a number of early chances. Attacks from both wings were evident but the final ball failed to provide a goalscoring chance in the early exchanges. 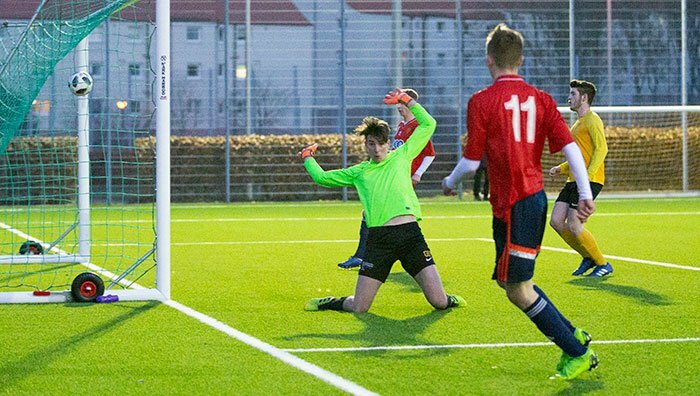 Indeed Scotland’s young goalkeeper, Jacques Herraghty (Holyrood Sec)had to make a couple of early blocking saves to prevent the students taking a lead. After twenty minutes the schoolboys took the lead when striker Lyall Cameron ( St John’s HS) netted from 15 yards with a well -placed shot into the corner of the net. 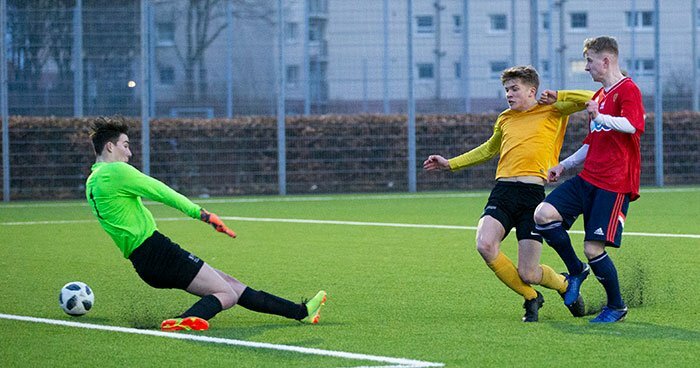 The same player missed the chance to score again when, following a trip on Ben Cameron ( Bearsden Academy) in the box, he struck his spot kick too close to the Glasgow keeper who duly saved the shot. Before half time Sam Walker (Stewart’s Melvilles College), who had earlier missed a good chance, made no mistake with his second opportunity placing his shot well following good build up play involving Cameron , Josh Mulligan (Grove Acad))and Jack Hodge (Graeme HS). As is normal in these warm up games the SSFA coaches, all practising teachers in schools, made a number of half time personnel and positional changes as they seek to find the best combinations for the difficult Centenary Shield programme ahead. Replacement keeper Lee Herbert (Buckie HS) was called into action immediately when he turned a well struck free kick around his post. After 15 minutes and having also missed an earlier, easier chance, forward Owen Andrew (Bell Baxter HS) did what all good strikers do by netting his second chance after a long pass from defender Josh McConville ( Harris Acad). Scotland looked solid in defence even after making changes and they were dominating possession but the student side kept playing and made the game competitive. The schoolboy team re – introduced a couple of players for the last 15 minutes and both Jack Hodge and Wilson Romanis (Graeme HS) had a big impact. Hodge brought renewed energy to the side and Romanis scored a great goal with a driving run and terrific finish to make the score 4- 0. 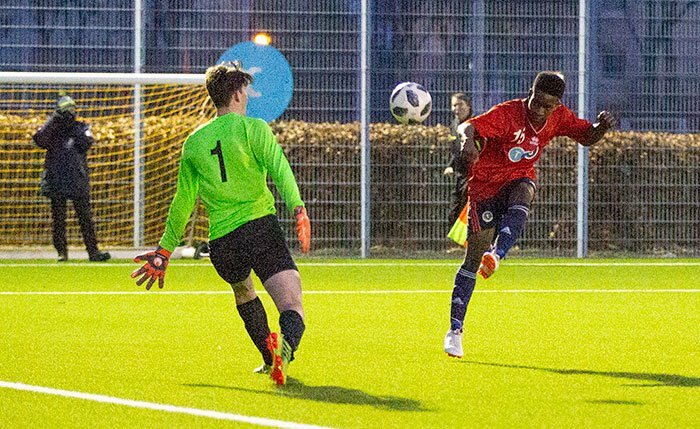 Tiwi Daramola ( St Mungo’s HS, Falkirk) had looked a danger through -out the second half and eventually he kept up his great scoring run for the SSFA team when he lifted the ball over the keeper a few minutes from time to complete the scoring. Once again every player involved made a good contribution to another confident warm up game win. The coaches will look forward to the analysis of the match footage provided by Glasgow University whose help was much appreciated. The squad gets together again on Wednesday 20th February when they visit the campus of Stirling University to play a University U20 team. The game has a 3.00pm kick off and will be played either on the astro pitch or the grass pitch at the Gannochy Pavilion.